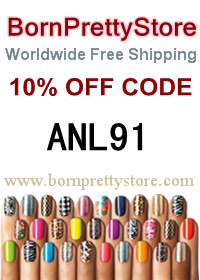 Today's Born Pretty Store review is of one of their new nail foils. The pattern I have today is A13. Since these are supposed to be a full-nail design foil, they were a little harder to work with and took some practice to get the hang of without ending up patchy. Tacky polish did not work for this foil, I had to use foil glue on a bare nail; no base coat. Two thin coats of fully dry glue worked best. These new foils are currently on sale for $2.30 USD, and come in 10 different patterns from floral to rainbow leopard print. They are pretty fun to play with and I had no issues with topcoat making them crinkle like some will. They did tend to want to chip quicker, though, since I didn't have an initial base of polish. If you do shop at BPS, you can always use my coupon code ANL91 for 10% off regular priced items.